Used everywhere; mainly kitchens, however it is used for many Industrial uses, anti fatigue and safety. Round openings to drain, tough Rubber. Compare our Airomat Anti Fatigue Mat, it's ONE STEP UP! Comfort Mate Kitchen, Commercial and Industrial matting comes in two colors, Red and Black. These are not just colors, the Red is made of a Nitrile Rubber compound that makes it grease and oil proof. While the Black color is grease resistant. Both are a great mat it just depends on your usage. If you have more grease and oil problems you might want use the red, if you are after a somewhat softer mat for a bit more fatigue relief you might want to use the black. There are 2 thicknesses, the half inch and the seven eights inch. The half inch is the more common mat and should stand up very well in most cases. Keep in mind the thicker mat has more strength but also is a bit higher, the half inch is easier to transition from floor to mat. 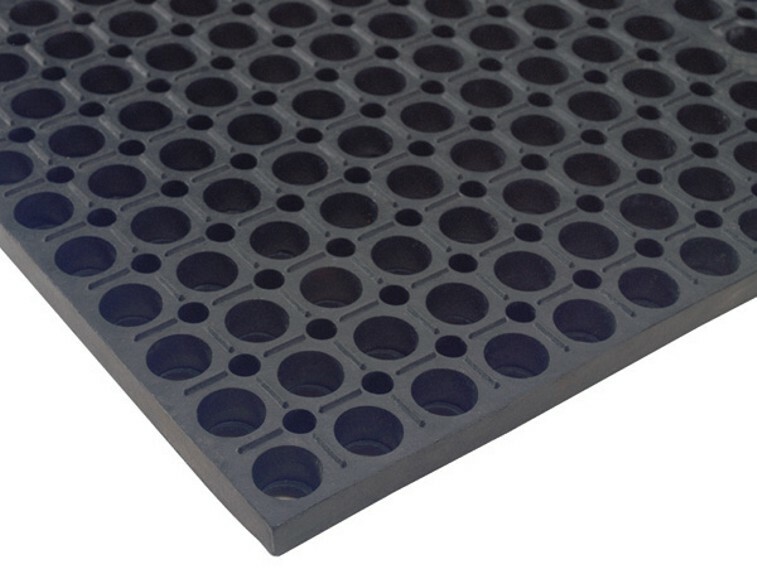 These mat have nice large round openings that help drain away liquids and trap debris away. The thicker mat (seven eights inch thick) comes with flat squared edges that fit up to each other and comes with connectors for making any size you might need or simply covering the entire floor. 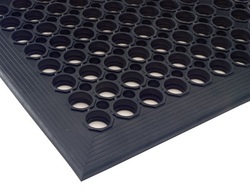 The half inch mat comes with ramps for a nice transition from floor to mat. An Andersen product which is a 100% guaranteed mat. Red = Nitrile Rubber, starts as a firmer mat, gets softer over time. Longer lasting and stands up to more.